The space for public discussion in Belarus is contracting. The news on 11 October that a Belarusian court had arrested Pyotr Ryabov, a Russian historian and member of the self-styled anarcho-communist alliance “Autonomous Action”. 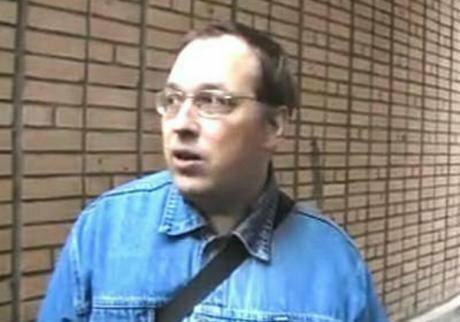 Ryabov was convicted of “petty hooliganism” and banned from entering the country for ten years for supposedly using abusive language and distributing extremist material. This is not the first time the authorities have shown an interest in Ryabov: he has previously been detained for picketing and prior to public lectures. Pyotr Ryabov has a PhD in philosophy and is a senior lecturer at the Faculty of Philosophy at Moscow’s Lenin State Pedagogical University. He lectures on Ancient Greece at Moscow’s Arhe cultural and educational centre and researches the history and philosophy of Anarchism. He is the author of several books on anarchism, history and Ancient Greece. At first glance, this looks ike a purely academic career, but Ryabov still posed a danger to Alexander Lukashenka’s regime. 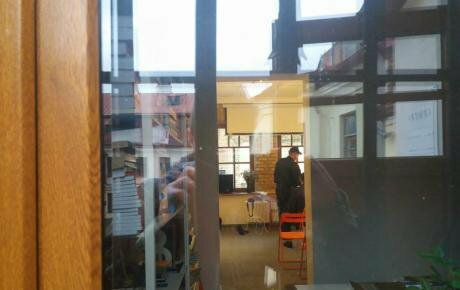 Since August this year, Belarus has seen a punk concert disrupted, a lecture by a Moscow anti-fascist activist interrupted by police, and police have searched the homes of anarchists in Hrodna and confiscated computers at a Minsk cooperative. What is it about your history lectures that makes the authorities so concerned? Pyotr Ryabov: I intended to give a lecture on late 20th century libertarian philosophy, but 14 minutes into it, as I was speaking about existentialism, the riot police interrupted. They closed off all the exits, and some people were detained. I was also supposed to give a lecture in Baranavichy, about anarchists during the Russian Revolution. But after the security organs got involved, the event turned into a tiny gathering in a flat. The reaction has been surprising, but I suspect it’s not the police that were behind this, but the local KGB. The lectures I give when I travel around Russia have never provoked this kind of response. The state has overestimated my contribution to revolutionary propaganda: several of my lectures would have caused less fuss than if they’d been banned. I think the reason here is the word “anarchism”. The authorities remember both the fact that anarchists were sentenced for an arson attack on the Russian consulate in 2010, and that they, in many cases, led the recent protests against Belarus’ “parasite law”. You’ve previously been detained for participating in rallies, and now you’ve just spent almost a week in jail. What do you think about hospitality, Lukashenka-style? PR: I spent those six days, as any academic would — I wrote more than 100 pages analysing what was happening from an anthropological perspective. This is perhaps why the prison staff and inmates called me “professor”, and I didn’t try to stop them. It was an excellent opportunity for intensive anthropological observation, a kind of excursion to the repressive facilities that I hadn’t been in for a long time. Belarusian police at Center of City Life in Hrodno. Source: Social networks. In a cell, your whole life is structured down to the last minute, but the prisoners have not only not set up this timetable, but don’t even have watches or clocks to follow it. It’s not just a forced system of control over a person’s time: it recalls Kafka’s castle. A pre-trial remand prison has similarly strict rules which are, however, unknown to its inmates and therefore can’t be obeyed. It reminded me, in a way, of life in Belarus in general, as local activists had described it to me. Who were your cellmates? How did you get on with them? PR: There are a lot of broken people there. One man, for example, has been waiting a month and a half to be expelled from the country, but is afraid to bring the subject up and doesn’t want to file a complaint, although the official date for his expulsion has long since passed. On the other hand, I got to know hardened thieves, awaiting transfer to prison colonies, who gave me moral support and shared their coffee. Given how cold it was in the building (it is unheated, and the temperature fell below zero at night), this was a real sign of solidarity. In other words, everything is designed to humiliate and break people. I couldn’t stop thinking about the fact that many of the other inmates will have to spend years in these intolerable and inhuman conditions. On the other hand, is it very different from life on the outside? The “regulars”, however, told me that this remand prison was much better than the others. And in general, I had privileged conditions there, thanks to pickets outside Belarusian embassies in other countries and letters from friends and articles in the media about the police interrupting my lectures. The Russian consul even came to see me: the first time he had ever visited a fellow-citizen behind bars. All this attention meant that the warders didn’t humiliate me more than they had to and observed all the formalities: they even let me see a doctor, who shared his meagre stock of medication with me. They also gave me sheets, which a lightning poll I conducted told me were unavailable to anyone else, and, best of all, they sometimes gave me hot water, an unheard of luxury. And this was all because I was, supposedly, a professor. The prison staff also refrained from using the f-word to me: this was particularly funny because it forced them to choose their words carefully (and because one of the offences I was charged with was the use of foul language in a public space). And I had a cell to myself, with books and notebooks, so it wasn’t so bad: I was able to engage in fieldwork in unfamiliar conditions, an un-academic setting that in fact inclined me to reflection. You are a populariser of the anarchist ideas of Pyotr Kropotkin, Nestor Makhno and Emma Goldman, all of whom spent time in prison for their views. Did you find any parallels with your situation in their memoirs? PR: Well, this isn’t the first time I’ve been in prison. I served six days back in 1996 for taking part in an unsanctioned opposition march in Minsk; they squeezed twenty people into one cell and we slept side by side on planks. Now they usually have bunks, which are still uncomfortable but at least they are individual. In those days we also just had a hole in the corner for a toilet; now there’s a proper flush lavatory and even a basin in a walled off area. When I felt depressed, my mind went back to the hardships endured by anarchists, populists and revolutionaries in Tsarist Russia. I remembered the Decembrists exiled to Siberia for 20 years and thought, “Hey, I’ve only got a week to serve”. I certainly thought about the historical parallels and recalled passages from Kropotkin. It was his advice that decided me to work out every day. I also remembered Emma Goldman’s memoirs and her thoughts on how to avoid getting depressed in prison. 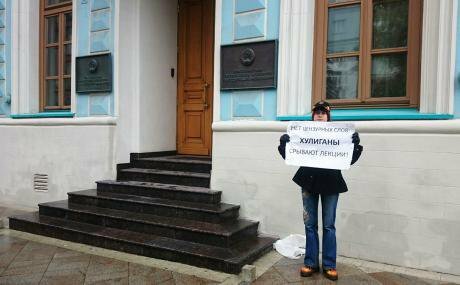 Picket in support of Ryabov at Belarusian Embassy, Moscow. Source: rbc.ru. All rights reserved. Prison is the ideal model for the state. When you write a book on this subject you become an academic theoretician who finds himself beginning to forget the meaning of the words he uses. In prison, everything is concentrated and tangible at a sensory level, whereas I would recall the views of Anarchist ideologists about prison on a more existential level, in a context of resistance. Twenty years ago I wrote an article about the hunger strike as a tool of resistance, and now I had a chance to try it out in practice. You declared a hunger strike in court. Was this a protest at your imprisonment? What made you decide to do this? PR: A hunger strike is a completely natural action, and not even because some famous political prisoners have done the same thing in their time. And not because people will feel sorry for you and the regime will be shamed. That is all completely unimportant. What was important to me was to somehow make a stand against the unjust actions of the Special Services. I wanted to protest, but how could I do it? Once you have been convicted of a crime, you become just a body flung into a dungeon without daylight. My hunger strike is an attempt to prove that I’m not just a thing: I can take decisions for myself. A hunger strike is a weapon for the weaponless; a way to remain normal when everything around is abnormal. It is an inner need for resistance when there are no other means of resistance. It’s not hard to stop eating, and everything can go smoothly when your motivation is clear. I’d never done it before, but it wasn’t a dry fast — I did drink water. The only thing was that I had a cold. Being in a prison without warm clothing and food didn’t help, and I was afraid that my cold might turn into pneumonia. So I hardly slept the whole time. I was short of breath all night, from coughing and being chilled. And of course I remembered Ildar Dadin, who has now been forgotten, but who was a real hero who fought for months, and eventually managed, to overturn an earlier reading of the law on picketing. You are not only a teacher of, and writer on, philosophy, but also part of Russia’s anarchist movement. On the basis of your experience of a Belarusian jail and that of your ideological associates in Russia, are there comparisons you could draw between the repressive systems in the two countries? PR: I have certainly spent a lot of time with people who have unfortunately experienced prison conditions in both countries. It’s a question of nuances. In one sense, President Lukashenka’s police state is worse than Vladimir Putin’s rule in Russia. Legislation is harsher there: in Russia, using foul language in a public space can lead to a caution or a fine; in Byelorussia it’s a sentence of up to 15 days, and local people say it happens all the time. On the other hand, where Russia is concerned I only have the experience of anarchist friends in Moscow and St Petersburg to go on. In the regions, pressure on social activists from the police and the Internal Ministry’s Centre for Combating Extremism is much stronger: there have been notable cases of harassment and threats against activists from the security services in Irkutsk and Nizhny Novgorod, for example. Many activists have been forced to emigrate and others imprisoned after the Bolotnaya Square Case — Alexey Gaskarov, for instance, who served a prison sentence for alleged “incitement to mass riots”, and Dmitri Buchenkov, who is still awaiting sentencing. So, despite their mutual antagonism, there’s little to choose between them in terms of abuse of power. In Belarus, someone was recently given a two year sentence for taking part in anti-corruption protests — all this is going on in the background and seems to have become “normal”. On the other hand, there you can buy tickets for public transport without showing your ID and you can walk in and out of university buildings without a pass, whereas in Russia that hasn’t been possible for a long time as part of a public control system. Have you taken anything positive out of your various adventures? However, if the Belarusian government exaggerated the danger I presented, other people have been overestimating the importance of what happened to me. Dozens of people are in prison for their political activities and they, alas, won’t be out after a week. Both anarchists as individuals and Autonomous Action, of which I have been a member, could have fought this. Unfortunately, however, we can only speak in the past tense: it has had a long history, but has now folded. We, as anarchists, must in any case take part in any mass demonstrations that take place and try to steer them towards self-organisation and direct democracy, and away from the control exercised by politicians like Alexey Navalny.